Tamar Zinguer received her professional degree from The Cooper Union in 1989, her M.Sc. 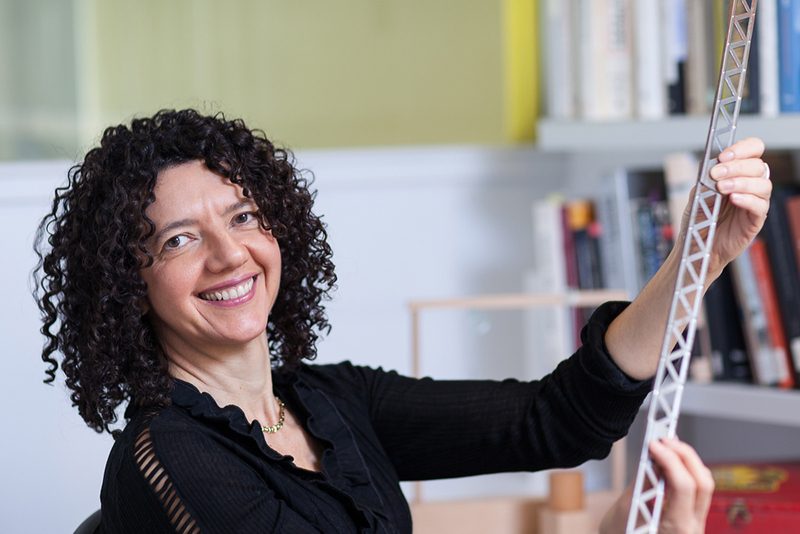 in Architecture from the Technion – Israel Institute of Technology – in 1998 and her Ph.D. from Princeton University School of Architecture in 2006. She has practiced architecture in Israel and the United States, and before coming to The Cooper Union has taught design, as well as history and theory seminars in architecture schools since 1994 – at the Technion, Cornell University, Columbia University and Princeton University, where she is a Visiting Professor in Spring 2016. She has been the recipient of numerous grants and fellowships – from the Canadian Center for Architecture, The Smithsonian Institution, The Lemelson Center for the Study of Invention, as well as the Center for American Studies at Princeton University. She has received the Whiting fellowship in the Humanities, The Best Young Architect Award in Israel and the America/Israel Keren Sharet Prize in the arts. Her book Architecture in Play: Intimations of Modernism in Architectural Toys was published by University of Virginia Press in 2015. She has received a Barre-Ferree grant for the publication and has lectured extensively on the topic at professional conferences (College Art Association, Society of Architectural Historians, The Association for the Study of Play), and was an invited speaker at a variety of universities such as Cornell, UPenn, U. of Tennessee, U. of Minnesota, The Smithsonian and University of Rhein-Mein in Wiesbaden, Germany, where she also gave a two-weeks long workshop and seminar. Part of her work on the Eames Toy was translated to French and appeared in Azimuts, June 2005 Issue on Design and Mathematics. Currently, Tamar is at work on two new manuscripts. The first – The History of the Sandbox - expands issues of space and play developed in first book, and was presented at the Society for the History of Children and Youth. The second manuscript at work – The Degree Zero of Architecture – benefitted from a research grant as a Visiting Scholar at the Canadian Center of Architecture in 2014, where Tamar presented her research in a public seminar. Parts of these writings were presented at SAH as well as to the European research group – “Degree Zero of Sound and Image” in 2015. Another area of research concentrates on Architecture and the Aesthetics of Movement. Tamar has organized and chaired a session on that subject at the Society of Architectural Historians Annual Meeting in Cincinnati, Ohio, April 2008, and has participated in a conference on a related subject, "Speed", at The Canadian Center for Architecture, Montreal, in June 2008. Tamar organized the academic conference ARCHITECTURE MOVES that took place at The Cooper Union in October 2009. Scholars were invited to probe the intersections of architecture and the aesthetics of movement. The conference explored temporality and animation in space, displacement of vision, rhythm and spatial relocation – aspects of movement in architecture from the 19th to the 21st centuries. At The Cooper Union since 2004, Tamar has taught design studios and history and theory courses in both the graduate and undergraduate programs. Her seminars have ranged on aspects of Architecture in Play, Invention in American Architecture as well as Writing Architecture; she has also taught Modern Architectural History (1750-1950) since 2010. In the studio, she has taught Third Year Design Studio (primarily Analysis), Architectonics and Thesis. View Tamar Zinguer's CV here. Architecture in Play: Intimations of Modernism in Architectural Toys explores how in the last two hundred years, architectural toys – blocks and construction sets – have echoed full-scale architectural experimentations. Architectural toys have provided evidence of the social and economic life of their period; have reflected stylistic inclinations and have incorporated technological changes in their ‘systems of construction’. Designed by adults for children, these toys have presented an intersection between generations and a meeting point between pedagogy and means of production. Four construction toys are investigated – dating from 1836 to 1952 and made of wood, stone, metal and paper. With the advent of industrialization, they have indicated changing attitudes towards form, structure and permanence. They have classified and divided the environment, and through play provided tools to recreate its orders. 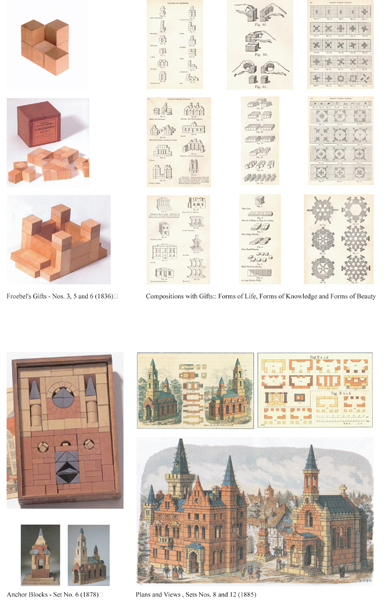 Froebel’s Gifts designed in1836 included a series of cubes, spheres and cylinders that were gradually broken down to smaller geometrical parts and were introduced to children in the Kindergarten setting; Anchor Stone Building Blocks invented in1877 comprised hundreds shapes of miniature stones that yielded castles, forts and churches; Meccano (1901) and Erector Set (1911) included small metal girders that constructed bridges and skyscrapers mimetic of contemporary steel structures; while The Toy and House of Cards designed by Charles and Ray Eames in 1950 and 1952 were lightweight, cardboard kits-of-parts that echoed methods of prefabrication. Allowing for a large array of assemblies and connections, all case-studies shared the breakdown of contemporary conventions of architecture. A structured dissection of natural formations was followed by the decomposition of known molds of space, to be replaced by light building parts, suggesting prefabrication and mobility gradually questioning the nature of the house. Thus, play with construction sets wavered between getting used to an existing reality while simultaneously performing the destruction of that same reality. The vision offered by the construction toy enacted persistently an image of collapse. Breakdown and collapse, construction and taking apart have positioned architectural toys as tools that appeared to advance – at all times – the constant reevaluation of spatial design. 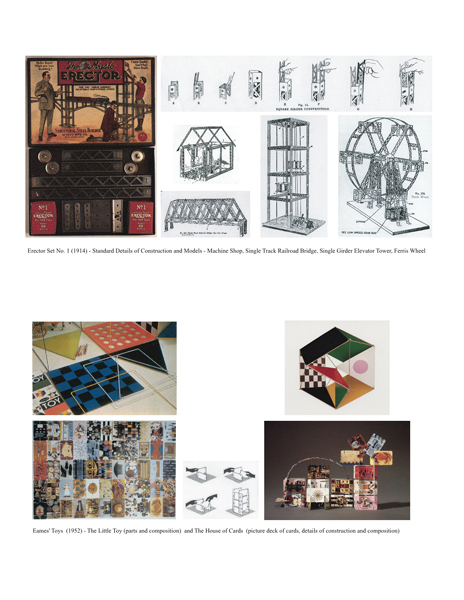 Lightness of building materials, modularity, systematization and greater versatility were parts of an architectural language that the toys exemplified. In the intimacy of the domestic environment, eradicating formal habits and re-conceiving visual orders, architectural toys intimated notions of the modern. The article "TOY" appeared in Cold War Hothouses, Princeton Architectural Press, 2004. 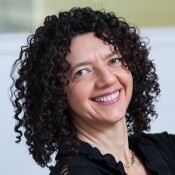 As part of the conference Speed and its Limits, held at the Canadian Center for Architecture in June of 2008, Tamar Zinguer gave the talk The Velocity of Play Around 1900, which discusses the changing faces of play at the turn of the 20th century – how play has been shaped by speed, acceleration, collapse, and fear. Architecture Moves probes the intersections of architecture and the aesthetics of movement from the 19th to the 21st century, exploring rhythm and spatial relocation, displacement of vision, temporality and animation in space. When in 1885, Marie Zakrzewska, one of the pioneering women doctors in the US, first saw sand hills in the public gardens in Berlin, where children of all economic backgrounds played, she immediately wrote a recommendation to the authorities in Massachusetts. Her letter resulted in the placement of the first sand heap in Boston in 1886; and following its enthusiastic reception—sand piles were believed to save children from the dangers inherent in living in slums—ten more heaps were placed by the following year. By that time, however, knowledge that a sand pile was a pedagogical tool was almost forty years old. 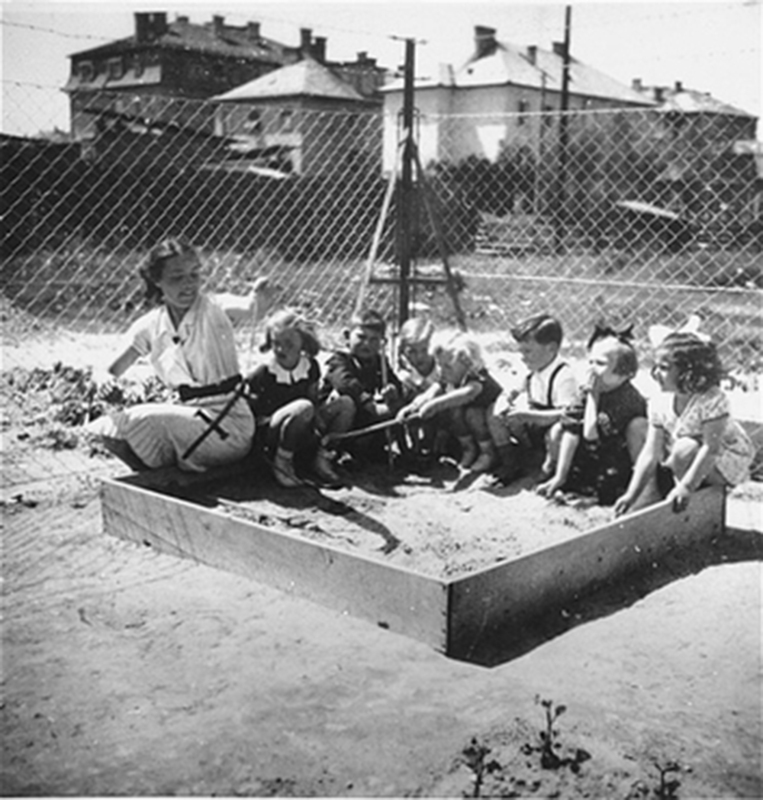 In 1847, a former student wrote to Friedrich Froebel of the benefits of sand gardens, a practice that Froebel subsequently included in his educational practices, as recorded in the Pedagogics of the Kindergarten. 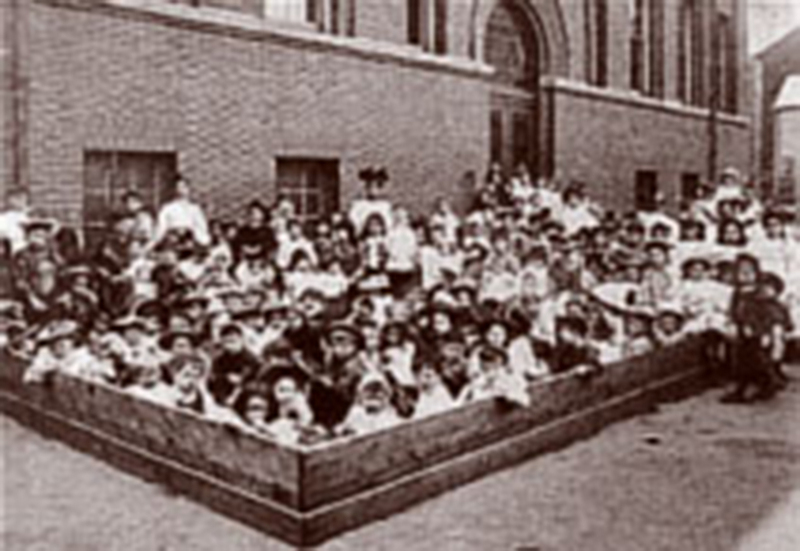 By the end of the 19th century, the educational benefits of the sandbox were unanimously recognized, as recorded in G. Stanley Hall, The History of a Sand Pile, of 1897. A similar spirit of social healing and civic recovery following the great devastation of World War II permeated the playground designs of Aldo Van Eyck in the Netherlands in the late 1940s. 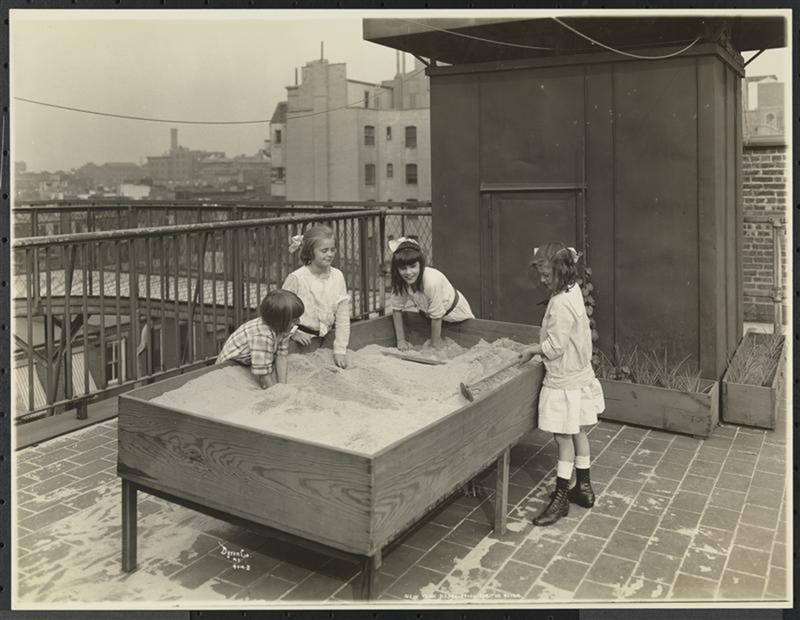 The sandbox was a site—integrated within most playgrounds—of construction and recovery through play. 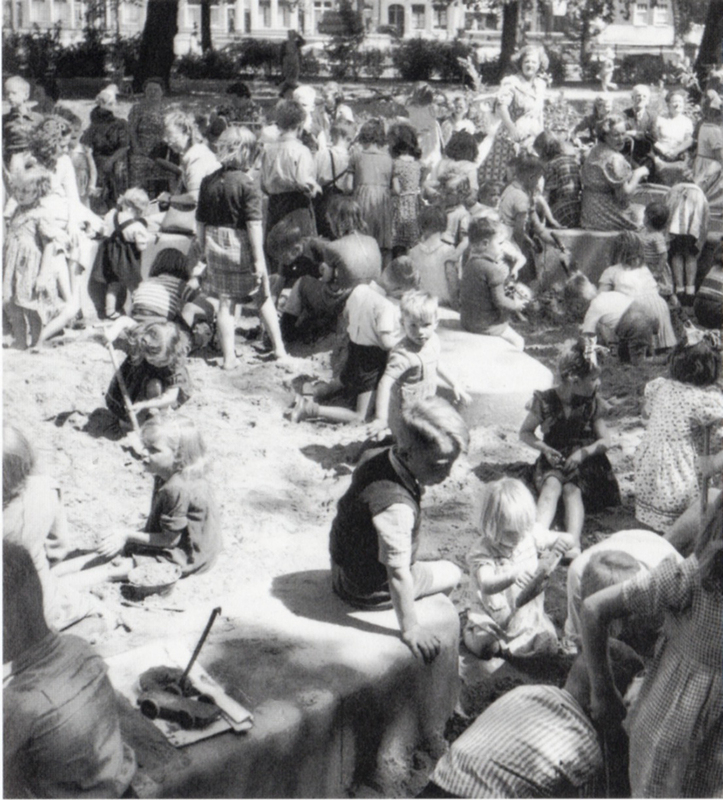 But already post-war, voices of disagreement were heard: the sandbox was unsanitary, a danger for children, a breeder of diseases – in short, an unacceptable urban space. Such growing concerns, on both sides of the Atlantic, lead in the late 1960s to the gradual disappearance of sandboxes from play spaces. That moment, however, coincided with the appearance of sand and the sandbox as a common figure in art. In a landmark article “A Tour of the Monuments of Passaic, NJ,” (Artforum, 1967) Robert Smithson elevates the sand-box to the status of a monument, a “model desert” – in short, an earthwork. He utilizes this earthwork to demonstrate a general state of imminent destruction (inherent in any sand construction) and of entropy – as there is no way to restore “order” within grains of sand. 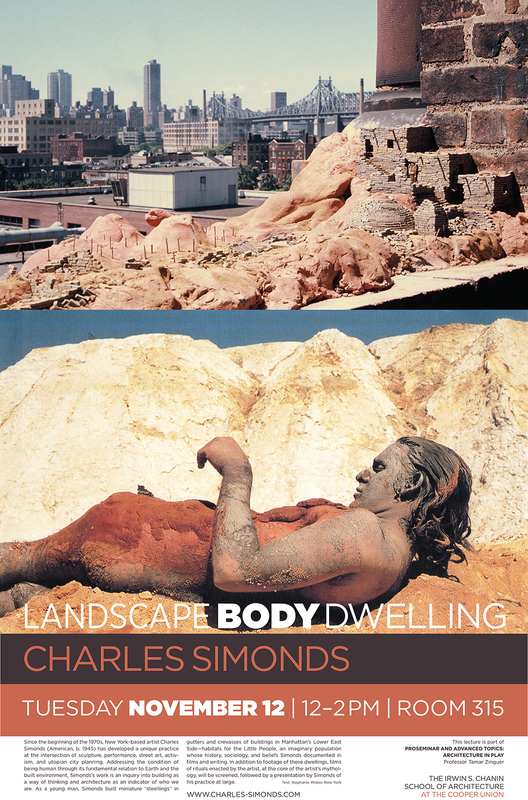 This book follows the history of the sandbox, from its rise as a tool of civic healing to its demise as a site where diseases fester, and to its resurrection as a potent artistic medium exemplifying like no other the destruction inherent in any creative act. Today, the sandbox is still a site in flux.